Whether you have played a course 20+ times a year or looking to play the course for the first time, insights from an insider can help enhance your golf experience. 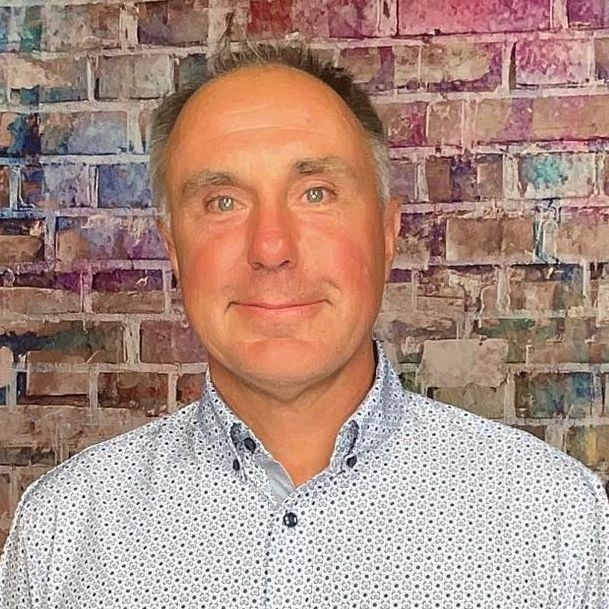 Below is an interview with David Kass who shares some valuable tidbits about the course, memorable holes and must eats and treats at the 19th. Salish Cliffs opened in September, 2011 and was created by renowned golf-course architect Gene Bates. The course rolls through natural vegetation and rock facings and boasts 360-degree views of the Kamilche Valley and dramatic elevation changes, including the par-4 12th hole with a tee box that sits on the property's apex, some 650 feet above sea level. Privacy abounds with 16 of 18 holes encircled in lush forestry. Hole Nos. 9 and No. 18 share an expansive 15,000 square-foot double green with a sparkling lake and wetland preserve separating the holes. Salish Cliffs is playable for all skill levels. The layout flows along with frequent uphill and downhill tests, stern, but fair, par-3s, and challenging bunker placements and shapes. Many of our guests comment that the greens are the best they have ever putted on. We are also adjacent to the Little Creek Casino Resort, which is owned and operated by the Squaxin Island Tribe and known for its wide array of casino games as well as a brand-new RV Park, Seven Inlets Spa, Skookum Spirit Cigar & Wine Lounge, first-class entertainment, and seven restaurant and bar options. The fairways are wider in the landing areas than they look. If you can figure out where Gene Bates (course architect) positioned the correct landing area on each hole, you'll be ahead of the competition. Driver is not always needed, or even advisable, to reach the widest part of the fairway. I've never heard a golfer talking at the "19th hole" about how much lower their score would have been if they'd hit it 5 yards further on each hole, but hear lots of talk how much better they'd have scored if their tee shots had been just a few feet left or right all day! Salish Cliffs adheres to the old golf adage that "golf is not a game of length, it's a game of width." In 2013, Salish Cliffs earned the No. 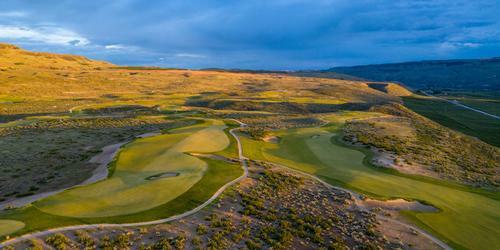 3 spot in Golfweek's 2013 "America's Best Courses You Can Play" in Washington. The course also garnered Top-10 status in Golf Digest's biennial "2013-14 America's Greatest Courses" by state list and Golfweek's "Top-50 Best Casino Courses" list. 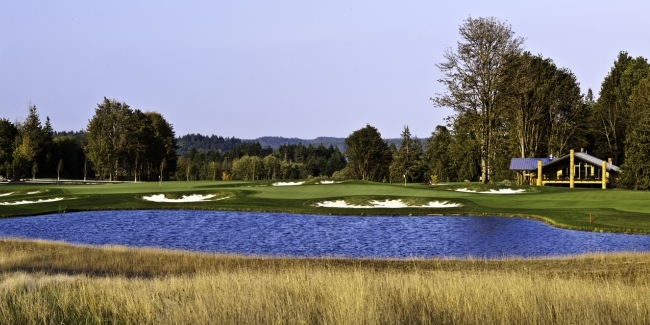 In addition, Salish Cliffs was named "Best New Course" by Golfweek and GOLF Magazine in 2011, just months after its grand opening. Also, last year Salish Cliffs became the first "Salmon-Safe"-certified golf course in the world, after successfully passing an exhaustive assessment verifying the Tribe's commitment to protecting native habitat, managing water runoff, reducing pesticides, and advancing environmental practices throughout the region. So many great shots out there to be taken, but No. 15 probably gets the most because it is visually stunning and I've yet to see a bad picture of the hole. The topography of the hole makes it an easy picture with the tee and green at almost the same height, yet the tee shot traveling dramatically downhill followed by a challenging shot back uphill to the green. The 14th hole nearly represents what one visiting golf writer referred to as a great Par 4 ½. To begin, it comes late in the round sandwiched between two other strong four pars and is often the pivotal hole in your round, with the ability to make or break your score. Often playing into the wind, the hole plays longer than the 383-437 yards it measures from the middle to championship tees. Good tee shots are rewarded with a challenging, but manageable mid to long iron approach over a wetland that guards nearly all of the peninsula-shaped green. Even if you pull off the shot, the green consists of several tiered sections which can lead to a quick three-putt after two quality shots. Missing the fairway really adds to the challenge. Players are left with a long shot out of the rough or sand that is usually best taken on by laying up short or left of the wetlands. To give oneself the best opportunity to get a third shot up and down for par, layups should be made by taking into account the hole location to keep from leaving yourself with a short-sided shot over the wetland hazard. Many match play games have been won via a conservative three-shot approach and bogey five, while an opponent's go for it in two strategy left them with a lost hole and at least one ball less than they started the 14th. Then again, there's something special about having a 'pop' after the round with your playing partners and reminiscing about that amazing second shot that you "pulled off" on the 14th! Killer 1/2 pound burgers and the halibut sandwich are can't miss lunch items...try the fish blackened for a little extra spice! Irish Death on tap has been a great hit with our golfers! It looks and pours almost like a Guinness, but is much smoother and less bitter.